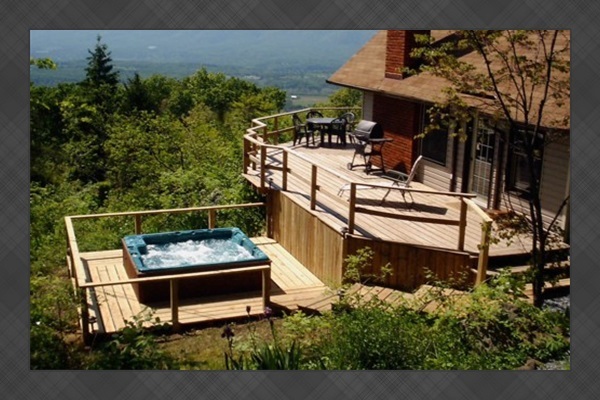 One of the best views ever experienced, is from the Cabin perched high on the Blue Ridge Mountains with breathtaking panoramic views of the mountains, Shenandoah valley and river below. The cabin gives you an unbelievable vantage point. The cabin offers something special a relaxing, romantic, tranquil, retreat to rejuvenate and renew the spirit. Peaceful, cute, comfortable escape, with majestic views, set in it's own grounds, each season offering something totally different but always beautiful. Dining indoors in winter, with roaring log fires, candlelight & music. Relaxed outside dining in summer on the large wraparound decks with BBQ grills & wonderful Sunsets over the mountains. Hot Tub to soothe on private lower side deck, while watching the moon, the stars and the sparkling lights twinkling in the valley below. DC just over an hours drive away. For up to 4 persons extra persons $20 a night. Pets with permission $20 a night plus returnable pet cleaning deposit $50. 2 nights minimum Open all year. NO SMOKING in the cabin. 50% Deposit to book & confirm. Full payment 45 days prior to arrival. Nearby Attractions Hiking, Horse Riding, Swimming, Fishing, Canoeing, Kayaks, Tubes, Skiing, Mountain Biking, Golf, Vineyards, Birds, Butterflies, Wildlife, Skyline Drive, Caverns, Antiques, Historical, Indian & Civil War Sites, Flea Markets, Live Music, Good Places to Eat. ~Local Points of Interest~ The Shenandoah National Park & Skyline Drive are, without a doubt, the best way to take in the most amazing views of our beautiful valley from the comfort of your own vehicle. But it's also a hikers dream with miles of trails for beginners & longtime trekkers. Then, there's a totally different perspective from the Shenandoah River that runs throughout the entire valley. Like many of our former guests you can float lazily downstream or take a more active approach by canoe or kayak. More of a history buff? This area is so rich in Civil War & Native American history you can spend the entire day wandering through battlefields & museums. For those with an interest in adventure & geology there's Luray Caverns which is located less than fifteen minutes from the cabin. It's the largest caverns in the eastern U.S. not to mention the third largest in the country making it a "must see spot" while so close. Lake Arrowhead, in nearby Luray, has plenty of covered pavilions, playgrounds & great fishing spots but it's best known for it's mirror-like lake. The surrounding mountains reflect perfectly on the water. Spend a couple hours browsing through antique shops & flea markets. Sample merlot at one of the wineries in our area. Go horseback riding at a nearby stable. Listen to live music & local gossip at a neighborhood bar. Needless to say, the Shenandoah Valley is full of surprises, history & adventure!